Three days after the rescue of the colonists from New Caprica, Tigh, Tyrol, Anders and three other former insurgency leaders convene in the bowels of the Galactica. With them is a bound prisoner, Jammer, whom they have convicted of treason for his membership in the colony's Cylon-controlled police force. Jammer pleads for mercy, but his judges remain implacable. They eject him into space, making him the latest in a series of enemy collaborators whom they have tried, convicted and executed without the knowledge of Admiral Adama or Laura Roslin. Roslin is busy negotiating with Tom Zarek, who, as Gaius Baltar's vice president, has now become President in Baltar's absence. Lacking military support for his leadership, Zarek offers to cede the highest office to Roslin if she'll appoint him vice president once again. She agrees, and they schedule the power exchange for three days hence. Roslin has no idea that Zarek has authorized the secret tribunal aboard Galactica to execute all the worst collaborators before his brief presidency ends. Tigh embraces Zarek's orders with a zealot's dedication, but the tribunal's atmosphere of revenge soon grows too stifling for Anders. When his fellow members urge him to convict Felix Gaeta of treason merely because Gaeta worked for Baltar, Anders quits. The tribunal easily finds a willing replacement for him: his wife, Starbuck, who votes to convict Gaeta. While she is eager for this deadly vengeance, Anders longs for an end to the bloodshed he's witnessed as a resistance fighter. The couple's resulting conflict, springing from the separate traumas they endured during the occupation, threatens to split them apart. Far away, Gaius Baltar awakens to find himself confined aboard a Cylon baseship. Like the collaborators on the Galactica, his fate now hangs on the vote of an unsympathetic jury: the Cylon leaders. In the end, with the jury deadlocked, the decision comes to rest with Six, who must finally choose between her people and the human she loves. - As of this episode, the opening theme has been revised again to restore the stated primary objective of the survivors being the search for Earth. Images from the surface of New Caprica have been removed. - The survivor count has also been added back to the main title. Survivors, according to the main title: 41435. - According to Adama, despite the success of the exodus from New Caprica, thousands of people were left behind on the planet. - Apollo made a comment about losing "half a stone" (7lbs) of weight in this episode. I find the use of the term "stone" to be rather interesting. Did he adlib it because he's a British actor and it was kept in as a joke, or was this intentional? - Ryan Robbins, who plays Charlie Connor in this episode, also played the Armistice Officer (Boxey's father) in the pilot miniseries. - Jammer being executed by the Circle. - Tyrol speaking to Cally about how she was able to run away from her would be executioners. - Baltar's dream, then waking up aboard a Cylon basestar. - President Zarek declaring he will sign Roslin in as his Vice President, then voluntarily step down. - Tigh's outburst when Gaeta entered the CIC. - Tigh's outburst within the Circle concerning its legitimacy during the case deliberations just prior Gaeta's case's introduction. - Baltar's meeting with D'Anna. - Apollo: "Now if you'll excuse me, I have a date with a jump rope." Adama gives Apollo "the look." Apollo: "Hey I've dropped half a stone." Adama: "Keep jumping." - Gaeta's meeting with Starbuck. - Baltar's meeting with Caprica Six. - Tigh regarding Tyrol's hesitation to vote on Gaeta's guilt: "He doesn't want to say he's guilty because Gaeta is such a good guy. Right Chief? Everyone likes Gaeta, so let's let'm off the hook. Let's just look the other way on this one. Well a lot of good people had to pay the price for what they did. Choices they made on New Caprica. Like my wife. That's right. Ellen collaborated. Gave the Cylons information on the resistance and she died for it. Because that's the price for collaborating with the enemy. And I liked her a lot more than I like Gaeta." - Gaeta being brought before the Circle. - Roslin and Adama confronting Zarek about his actions as president giving the Circle impunity. - Tigh unpacking Ellen's clothes. - Roslin issuing a general pardon for every human being in the fleet. - Tyrol sitting with Gaeta in the mess. Collaborators is the obvious, expected episode after the chaos of Exodus, Part 2. The Colonials are having their own version of the Nuremberg Trials, executing collaborators with little to no due process. This is presented in a genuinely moving way, but pacing left much to be desired. Right from the start, the episode throws at you Jammer's execution. That signifies to the audience that it's going to be a break-neck-paced bloodbath episode, or at the very least, little time will be wasted on plot development and that the episode will tackle moral issues directly. Instead, much of the vigor of the episode is lost after the teaser as the Circle continues to conspire and act from morally ambiguous to almost genuinely evil. There's nothing particularly wrong with how the Circle was portrayed, but I did feel that since it lost much of its momentum, that less time should have been spent on depicting their various movements and deliberations. Instead, I was utterly fascinated by Batlar on the basestar. RDM spoke about how the internal set of the Cylon basestar would probably be disappointing, but I don't really agree. I felt that it was a well thought out set, and the surreal feel of it was just perfect for the narrative. What bothered me was how little actual substance there was to the plot aboard the basestar. It mostly consists of a handful of symbolic, though not quite progressive scenes. 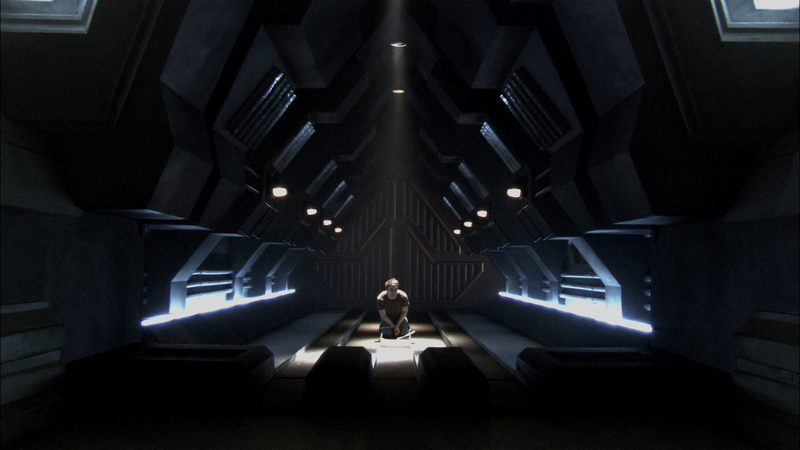 I felt that the parallel between Baltar's and Gaeta's survival hanging in the balance was ineffective because the plot was top heavy, swaying toward the Galactica. We got to see none of the Cylons deliberating, and too much of the Circle deliberating. With uneven portrayal, the attempted parallel is weak, or nonexistent depending on how you look at it. Instead, it's the little things in this episode that redeem it. Much like this episode's counterpart in season 2, Epiphanies, this episode is packed with emotion and little details which make it captivating. For example, I absolutely loved the clearly observable damage within the fleet, especially to Galactica. It was nice to see the CIC still being repaired, and I like how need of Gaeta's expertise to perform repairs tied together the damage storyline with the Circle storyline. Tigh's outburst in CIC was especially memorable, though it does bring up some lingering concerns. Just who is the XO of Galactica? Well, it was Helo, now it seems to be Tigh again. But technically Apollo outranks Tigh. Shouldn't Apollo take Tigh's place as XO? Furthermore, just what function is Apollo serving within the fleet? He still parades around in his commander's pips and Pegasus uniform, but he's got no Pegasus to command. All we got out of poor Apollo this episode was an acknowledgment that he's trying to lose weight. A funny scene, and I enjoyed it, but we needed more from Apollo, and the command structure aboard Galactica needs some serious cleanup. Another nice detail was all the apparent civilians still aboard the Galactica since the exodus. With the loss of so many ships in the fleet since the settling and exodus of New Caprica, it makes sense that there would be some overcrowding and some civilians permanently settled aboard the Galactica. 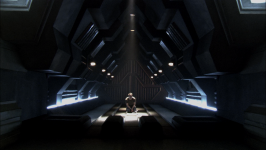 Though another lingering question the episode should have answered was what of New Caprica? This episode establishes that thousands of people were left behind and unable to be rescued. What happened to them? What will happen to them? Also, was nobody in the fleet able to notice bodies being expelled from the Galactica by the Circle? Finally, the stuff with Roslin and Zarek is fantastic, but again, it left me questioning some of the construction. While I loved Zarek's pragmatic attitude about not being able to retain the presidency in the face of his unpopularity, I think I would have preferred him to try to hold onto that power. After all, it is legally his. The fleet elected him for gods sakes. A better plot would have had Zarek name Roslin his vice president in an attempt to please Adama and get him on his side. I am also somewhat confused about Zarek authorizing the proceedings of the Circle. It seems in some ways out of character for Tom, a man who was the victim of (from his perspective) an unjust government, authorizing the arbitrary execution of suspected collaborators without due process. I suppose in some ways that is in keeping with his character's prominent dark side, but nevertheless it still felt a bit out of place. Conversely, I absolutely adored Roslin's full pardon for all humans in the fleet. That of course raises the obvious question: will Roslin's full pardon extend to Baltar when he is at some point reunited with the fleet? All in all Collaborators is a fair successor episode exploring the fallout of the New Caprica arc, with only a few minor blemishes. I took the 'thousands left behind' to mean the casualties of the original nuke which hit cloud 9, of the invasion and occupation, and then those lost during the rescue.